Nearly 800 students from Lutheran and Anglican churches across Canada gathered at Lakehead University’s Thunder Bay campus on Thursday afternoon to learn the history of Indigenous people and how colonization occurred in Canada, through what’s known as a blanket exercise. Organized and developed through Kairos — a coalition of ten national churches and religious organizations — this blanket exercise is a storytelling event that “tells the relationship between Indigenous and non-indigenous people in Canada,” according to Kairos’s program manager, Ed Bianchi. He said a total of 800 youths will start the exercise by standing on one of the many blankets laid out in front of them, which represents the land. As the exercise continues, the impact of colonization becomes evident as students on the blanket are either asked to stand closer together as their land continues to shrink, or step away from the blanket completely as they have died from lack of food. “As they are asked to leave the blankets, the land opens up and the Europeans move in and take it over and that’s represented by folding the blankets up,” Bianchi said. Before you know it, he said the floor which was once covered in blankets becomes bare. As a way for these students to fully feel and understand what happened, the blanket exercises are facilitated by Indigenous elders in the community, who “have essentially lived the story that the participants are hearing,” according to Bianchi. “That is very crucial and very important [because] it helps make it more real for people but it also helps people to understand how all these government programs and policies have an impact on human beings and how that is reflected in society,” Bianchi said. Thursday’s blanket exercise is the second event that elder Gene Nowegejick from Gull Bay First Nation has helped facilitate. “I am a descendent of the Robinson Superior Treaty of 1850 so I have a direct link to the treaty in this area, so I understand … what happened and what it was like and what’s happening moving forward,” elder Nowegejick explained. He said events like this are important because knowledge of the past can help prevent repeat occurrences in the future. 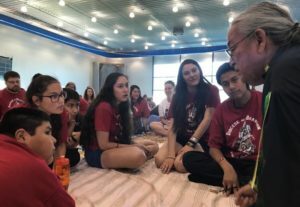 As a residential school survivor, Nowegejick believes this blanket exercise will not only help the 800 students learn the facts and truth about the history of Canada but also become future advocates. The most frequent response participants give after a blanket exercise, Bianchi says, is shock and confusion. Written by Christina Jung and originally published by CBC News on August 17, 2018.